Purpose - one-shot all known techs or multiple grouped techs, endgame fun tech. Either use Creative savegame or load snapshot. Charge up (anchor can help), unanchor. Controls like a helicopter. Shift - up and control height. W S A D - flight directions. Space - fire. Keep tapping shift throughout to control height during forward and turns. Fly around destroying all visible techs. Can reverse/brake too (D). 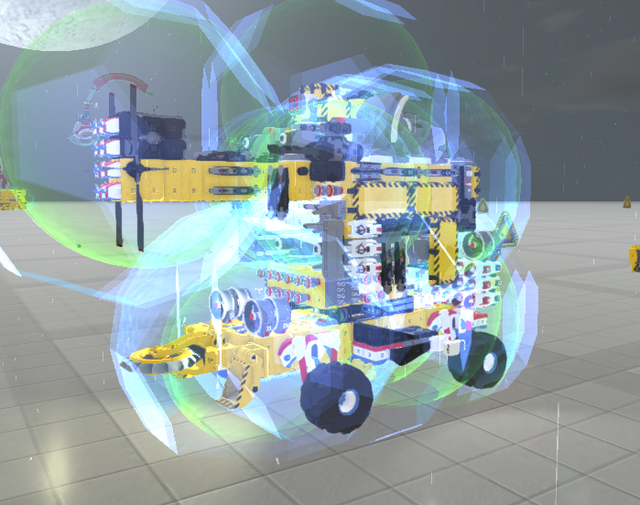 For this ComCore let me present you my GX Nimble Cargo - a little resource carrier capable of transporting a maximum of 42 chunks at high speed in one go, armed with light weaponry for self-defence. The intended purpose is to carry component chunks because unlike refined chunks that can be compressed into resource blocks and store back into inventory. COLLECT SOME RESOURCES AND PLACE THE RESOURCES DIRECTLY ON THE SILO (REAR) OR NEAR THE REAR PART OF THE TECH (VIA THE RECEIVERS). FLY OFF AND OBSERVE NOW YOU HAVE A RAINBOW TAIL OF RESOURCES. I usually call a group of vehicles that are built by a single person and have a common design style, so that is certainly another Benbacon type attack craft. I usually call a group of vehicles that are built by a single person and have a common design style, so that is certainly another Baconus type attack craft. how in the world did I muck that up. I've got three techs this week, sort of four if you count the drone. First up is the Brawler hovercraft. It's a straight up shoot stuff till it's in pieces kinda tech that can shrug off a fair amount of punishment too. Unanchor and shoot stuff. Next is the Roach Type C drone carrying, wall crawling (ceilings too! ), small mobile base. Release drones with X. Stop at the inside top of the loop for a challenge. Lastly is the Wolf Spider hover droneship. It carries four of the same drones used by the Roach, has similar mobile base capabilities, and can traverse most terrain. Press X and have fun avoiding your own drones. By tomorrow, I will have sorted next week's tech lot. Edit: Strange thing happened though. I reloaded the save, and all the stuff had teleported half a km away from where I placed it (or more). One of the chargers was even clipped into a monolith. oh and make sure to hit X at some point ok? It cant crash my little laptop. should there be a CC on making the most laggiest tech? Maybe, but it would be pretty annoying. And I am not liable for any damage caused due to no charge. Amazing submissions this week everyone! I'm closing the thread now so we've got time to prep them all. See you in an hour or so on the stream!